As we refreshed this higher-end bass chart, we discovered a few older models had become harder to find, so we removed the Cort Jeff Berlin Series Rithimic and the Spector Legend 4. In their place, we added the new Yamaha BB734A, while the chart sees the return of a modern classic in the Sterling by Music Man RAY34. There is rarely a better feeling than when you have a decent budget and you are able to look at some pretty expensive guitars. Bass players who are looking for an upgrade are usually going to save up enough so that their next purchase puts them at least one or two categories higher in terms of instrument quality compared to their existing setup. Bass guitars in the $1000 range are plentiful, and almost always awesome. This is the part of the market where you will see more refined components, better performance and overall higher quality instruments. For some, making an investment of this kind is a plunge, but for others it is a necessity – especially in the case of stage performers and recording artists. Whatever the case may be, we wanted to help you out by showing you some of the best models you can pick up in this price range. These six awesome bass guitars are just some of our favorites and a flavor of what’s on offer in the higher-end market. Whether your taste is conservative, or you like something a little more unconventional, our choices cover a wide spectrum. 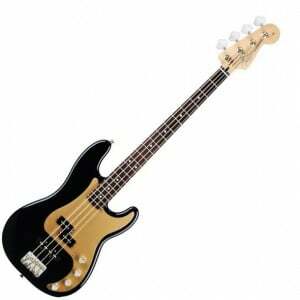 For more information, be sure to check out our guide to buying a good bass guitar. Let’s dive in! Versatile and toneful – a modern classic from Fender. Impressive bass that delivers on all fronts with a lot of success. True performer from Ibanez that brings great versatility and quality of tone. An active BB bass with huge tonal variety. A classic precision bass with a bit of that signature Harris twist. A solid, stage-worthy StingRay-inspired bass from Sterling. Fender’s elegant Jazz Bass that sounds as good as it looks! If you’re going premium, and the price tag is not important, you can’t go wrong with this wonderful Deluxe Active P Bass Special from Fender. Retailing at under $1000, this bass is one of the best on the market. With classic Fender styling, there’s a solid alder P Bass body with an easy to play satin-finished modern C-shaped maple Jazz neck – making one hell of a hybrid. As for sound and control, this is as versatile as its build, with two toneful vintage noiseless pickups – a Jazz Bass pickup at the bridge, with a Precision Bass pickup in the middle.With advanced controls, this bass is perfect for quickly changing between styles on stage or in the studio. Check out the full review of this excellent bass. While we have already covered some of their more affordable models in our special segment that covers the top beginner basses, Schecter’s top tier bass guitars have shown to be a true force to be reckoned with in these past several years. Hellraiser Extreme 4 is an absolute beast that packs a mean punch and looks incredible on top of that. What you’re looking at here is top tier build quality combined with set of EMG active pickups that bring on the thunder. Mahogany body, quilted maple top, white binding – it’s all there. In terms of tone, you can count on a wide range of options as the EMGs are reinforced by a pretty capable EQ section. Some would say that this is a metal bass more than anything else, but the scope of genres you can play with this thing goes way beyond metal alone. With that said, when it’s time to speed things up and headbang, Schecter Hellraiser Extreme 4 is more than ready to back you up. When you step away and look at this bass guitar from a distance, you quickly realize just how capable of an instrument it really is. 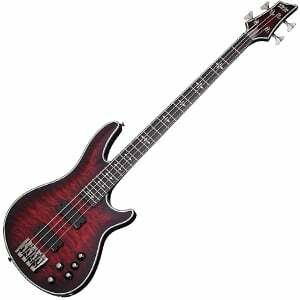 Ibanez is a brand that has a respectable presence in the entry level range of the bass guitar market. They make one of the best beginner bass guitars you can find at the moment, which you can read more about in our special piece. However, their higher end stuff is where the real Ibanez potential is seen. Ibanez SR800 offers a perfect combination of great materials, incredibly attractive design and naturally, impressive performance. We are talking about a professional grade bass guitar that sports all the right components to produce level of tone you deserve. These come with a set of Bartolini MK1 pickups and a flexible Ibanez three-band EQ. Body is a mahogany design that carries a poplar burl top, while the neck is a multi-ply piece made of Jatoba and Bubunga. The whole guitar has that exotic feel to it. However, Ibanez SR800 is not only about looks. This bad boy delivers one of the most expressive tones you can hope to work with. There’s lots of definition, range and warmth once you flip that switch. For the price, it’s among the most best you can find at the moment, and among the most unique as well. The BB734A is one of the higher-end models in Yamaha’s coveted BB Series and it proves well worthy of its sub-$1000 price tag, with big tonal versatility and sensational comfort. With two sophisticated finishes to choose between, the BB734A sports a well-contoured body made of alder and maple, with a five-piece maple/mahogany neck that features a super-sturdy construction and slim profile for modern playability. As we highlight in the full review of the BB734A, it’s voiced by two YGD Custom V7 pickups at the bridge and neck, with 3-band EQ and simple switching between active and passive circuits. For everything from modern metal to smooth jazz, the BB734A is an excellent choice. Fender Precision series have been the go to choice for a number of popular bass players throughout the last half of the century. 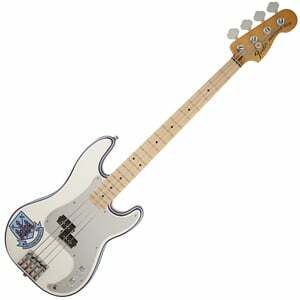 However, rarely is there anyone you can associate with this classic bass more than Steve Harris. What we have here is a Steve Harris signature series Precision bass that features some unique components and brings you an aesthetic worthy of the name it bears. Aside from the obvious West Ham United sticker, Fender Steve Harris Precision Bass is interesting because it sports a Seymour Duncan® SPB-4 pickup which is also Harris’ signature model. 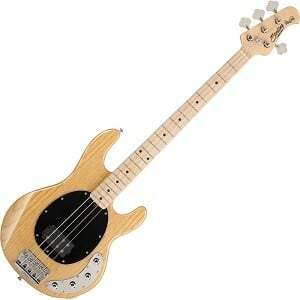 If you are a fan of Iron Maiden or simply like Steve’s bass tone, this bass guitar is the easiest way to get it. When you are not playing any of the dozens of popular Iron Maiden songs, this particular P Bass plays and sounds as good as any other from the family. It’s definitely not a restricted to metal only. Another superb bass to make this list is Sterling’s RAY34, which shows off an iconic no-nonsense design and advanced features. The iconic style we mention is, of course, cut from the same cloth as Music Man’s original StingRay, featuring a well-contoured body made of solid swamp ash with a natural finish and a black oval pickguard. Playability is fantastic, with a 21-fret maple neck that’s bolted on using six bolts instead of the traditional four, which hugely increases the sustain on offer. The tone is very stage-worthy and is provided by just a single Sterling-designed passive humbucker. Still, the versatility is surprisingly great with several active EQ controls. You can read more about the RAY34 from Sterling in the full review. Fender bring some elegance to this premium category, with their dark and delicious Aerodyne Jazz Bass. With the classic Jazz Bass double-cutaway shape, this Aerodyne features a solid basswood body with an all-black urethane finish and cream side binding. Very minimalist. It plays like a dream thanks to the satin-finished maple neck, with a comfortable C shape, rosewood fretboard and 20 medium jumbo frets. There’s nothing groundbreaking when it comes to hardware – the single-coil Jazz Bass bridge pickup and Precision Bass middle split single-coil are the highlights, although the smoked-chrome control knobs are very tasteful. As we highlight in our complete Fender Aerodyne Jazz Bass review, it sounds as good as it looks, and offers excellent value. 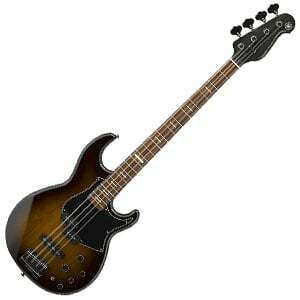 As you can see, finding a solid bass guitar for under $1000 is not that hard – it’s much harder to find something of quality on a strict budget! The majority of bass guitars in this higher-end market are pretty flawless, although you can find a few duds out there so be careful. Ultimately we have tried to show you some popular choices that place an emphasis on core performance and build quality, although they all look and sound pretty awesome too. If you are looking for a 5-string bass, you should check out our chart dedicated to 5-string bass guitars for sensible recommendations spanning all price categories. So whether you are a metal bassist looking for a model that won’t let you down during an energetic gig, or a jazz player who likes to relax with a quality bass at home, we hope you have found a little inspiration today. I owned an Aerodyne for a short while. Very nice feel, great looks, but like most single coil pups that bridge pickup hummed too much around fluorescent lights for my liking. But obviously a lot of people live with them.